Standing in a warehouse in a Moscow suburb, Dmitry Marinichev tries to speak over the deafening hum of hundreds of computers stacked on shelves hard at work mining for crypto money. “The form of currency we are used to is about to disappear,” predicts the 42-year-old entrepreneur, who also works as President Vladimir Putin’s adviser on internet matters. Marinichev is one of Russia’s leading crypto-businessmen at the helm of operations in this facility larger than a football pitch located in a former Soviet-era car factory, which collects virtual money on the accounts of its clients. Individuals, or firms like Marinichev’s, provide the computing power to run the so-called blockchain which records the world’s virtual money transactions. In return for providing that service they receive virtual money, of which bitcoin is the most popular, as payment — a process bitcoiners call “mining”. 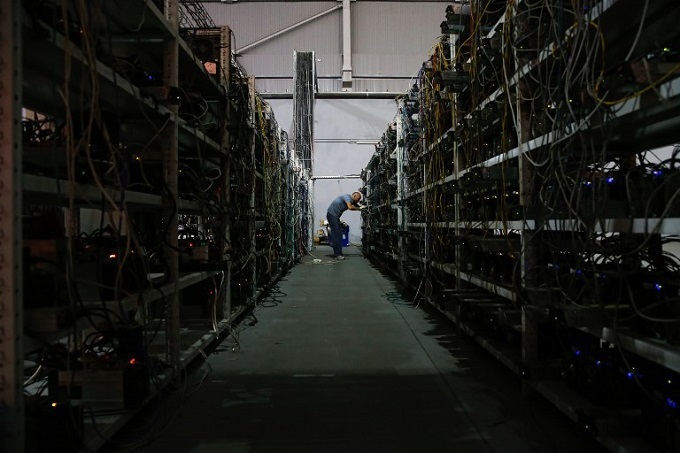 Mining farms like this represent a growing craze in Russia for bitcoin and other virtual currencies not backed by governments or central banks that are increasingly used for goods and services on the internet. The practice has become so popular in Russia that computer stores in the country have run out of graphic and video cards developed for gamers but are used by bitcoin miners to boost the processing power of their home computers. Marinichev this week unveiled a more sophisticated setup, inviting investors to pitch in $100 million to join a mining club and develop a Russian mining chip called Multiclet through his startup. “The form of currency we are used to is about to disappear,” predicts Dmitry Marinichev in the deafening hum of hundreds of computers stacked on shelves hard at work mining for crypto money. Photo by AFP/Mazim Zmeyev. “The explosion of virtual currency value has made mining profitable enough to make it a professional activity,” said Sergei, a 29-year-old computer scientist who runs half a dozen graphics cards plugged into the electrical grid of the company where he works. He launched his mining operation in March, when the value of bitcoin and its main competitor ethereum, created by Russian-Canadian Vitalik Buterin, reached record heights on the currency’s exchange. Since the beginning of 2017, bitcoin has quadrupled in value, surpassing $4,000 at the weekend, while ethereum experienced a rise of 4,500 percent to hit a record of $374 in June, later falling to $268 in August. While the assembly of a mining operation is easy enough, it consumes a large amount of electricity, which can reach the equivalent of several households’ needs. Russia has a competitive advantage as an environment for mining, as Marinichev points out in a brochure for prospective investors: electricity here costs just 1.3 US cents per kilowatt hour while long winters save money on cooling systems. Authorities in Russia were long suspicious of virtual money but have now come to recognise it as a force. A new bill is set to be debated this autumn which aims to regulate the possession and creation of crypto currency in the country. The legal foundation for virtual money has so far been non-existent in Russia and it is associated with illicit activities like hacking and used to purchase drugs on the dark web. “There is now an understanding at the highest level in the country that virtual currencies are not an absolute evil but a possible good, especially for the economy,” said Marinichev. Putin in early June even held a meeting at an economic forum with Buterin, the 23-year-old creator of ethereum, who lobbied the Russian president to expand the currency’s use in Russia. Last year, Russia’s largest banks tested the platform for some of their transactions. The country’s central bank even pondered development of a “national virtual currency”. Though at all-time-high in August at $116 billion, the global cryptocurrency market is still quite young, volatile and prone to speculation. Bitcoin, for example, lost almost a third of its value between mid-June and mid-July, before gaining it back over the course of a week. Since then, it has been regularly breaking records. “The rush to virtual money is not a fad or a fleeting phenomenon. The virtualisation of our lives is a market process that has gone on and will continue,” Marinichev said. In a sign of the times, several cafes and restaurants in Moscow this summer began to accept payments in virtual currencies.